» What Happens to Soccer Wunderkinds When They Aren’t So Wonderful Anymore? What Happens to Soccer Wunderkinds When They Aren’t So Wonderful Anymore? At the age of 15, my weekends mainly consisted of sitting on a darkened park bench, trying to keep down sickly swills of cheap cider while listening to tinny dance tunes playing from a cell phone. It’s fair to say that by the same age Martin Odegaard is outperforming me. Born in December 1998, the Norwegian has become soccer’s swaggering vanguard of a generation too young to remember the turn of the millennium or even the 2004 Super Bowl halftime show. He is the sport’s latest wunderkind, and maybe the most hyped teenager that soccer has ever produced. His Saturdays are rather different from those of his contemporaries. 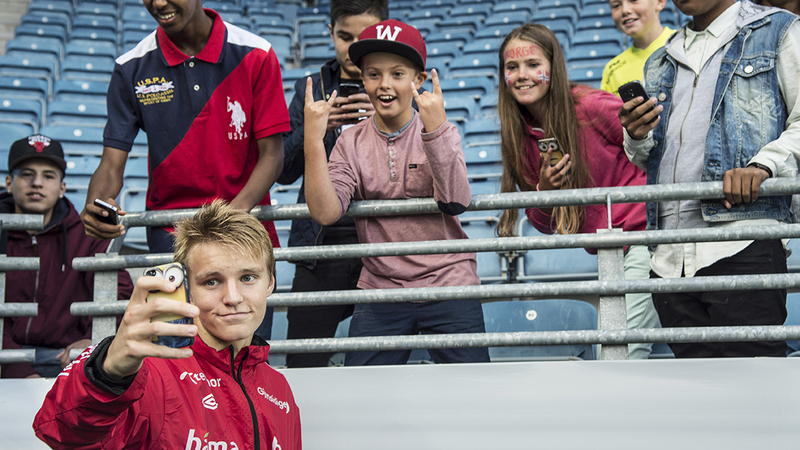 Odegaard first drew the attention of the hype merchants at the age of 6 and was training with Stromsgodset’s senior team by 13. He is now a central figure for the Norwegian champions, with some heralding him as the best player in the country’s Tippeligaen. Earlier this season, when Stromsgodset faced Stabaek, no fewer than 30 representatives from some of Europe’s biggest and best clubs were there to watch. Of course, they were there to catch a glimpse of only one player. At just 15 years and 253 days old, he made his international debut for Norway in August, playing an entire goalless draw against the United Arab Emirates. Last month, he became the youngest player to ever make a European Championship appearance, coming off the bench to feature in a 2-1 win over Bulgaria. He has already spent time training with Manchester United, Bayern Munich, and Borussia Dortmund. But Odegaard should be wary of going supernova. Because the wind that raises the 15-year-old also whispers the names of those who have failed before him. In soccer, wunderkinds rarely fulfill their wonder. Take John Bostock, for example. Regarded as the natural successor to Steven Gerrard and Frank Lampard, the English midfielder became a Premier League player at just 16, when he made the £1.25 million switch from Crystal Palace to Spurs in 2008. Following several loan spells with lower-league English clubs, and one with Toronto FC in MLS, of all places, Bostock now finds himself playing with OH Leuven of the Belgian second division. Kerlon is another player who was tipped for stardom as a teenager, with his seal-dribbling act making him a YouTube sensation. Ronaldinho even spoke of how one day Kerlon would inherit his no. 10 shirt for the Brazilian national team. Yet after unsuccessful spells with Inter Milan, Chievo, and Ajax, Kerlon, now 26, is now with Weymouth Wales, in Barbados. Cherno Samba scored 132 goals in 32 games as a 13-year-old for his high school team. Michael Johnson, the Man City youth product, was hailed as England’s most gifted young midfielder in a generation. Anthony Le Tallec was once described as the “new Zinedine Zidane.” Billy Kenny was christened the “Goodison Gazza” by Peter Beardsley while at Everton. All promised so much, yet delivered so little. It’s a pandemic. The focus on footballing wunderkinds might be more intense than ever,1 but the impulse to predict who will form the next generation is not an especially recent phenomenon. As long as there have been superstars in soccer, the race has been on to find the next one. Sonny Pike, for instance, was hailed as the next George Best/Diego Maradona following a string of ball-juggling TV appearances, earning him a move to Ajax’s academy at the age of 7. By 20, he had become a nomad of the English lower leagues, taking up a career in teaching soon after. Then there’s the wunderkind who can probably be credited with bringing the term to soccer, Freddy Adu. Billed as the era-defining superstar the U.S. had been waiting for, Adu was signed to a million-dollar deal by Nike at 13 before making his Major League Soccer debut in 2004 at 14. He made his debut for the U.S. national team at 16, was the youngest athlete ever to sign a contract to play for an American pro sports team, and then, at 18, made the move to Europe, joining Portuguese giants Benfica. Such a trajectory suggests that by now Adu should be dazzling under the lights of Old Trafford or Camp Nou. Instead, a decade after his professional debut, he is playing in Serbia with FK Jagodina — the 10th club of his career to date, even affording for an eight-month spell without a club after leaving Brazilian side Bahia in November. So what went wrong for Adu? Why is a player once dubbed America’s Pele now playing in front of as few as a thousand spectators in the Balkans? As is the case with so many teen prodigies, many claim that although Adu possessed natural ability, he lacked the required mentality to realize his potential. Philadelphia Union head coach John Hackworth even called him “self-centered” following a return to MLS between 2011 and 2013. Soccer is just as impatient as the rest of society. The urge to discover the next big thing before anyone else, like a record producer clicking through SoundCloud profiles of unsigned bands, is a human characteristic that cannot be suppressed, especially if you’re putting together a slideshow of “Soccer’s Top 10 Wunderkinds” or editing Das Wunderkind, a site that documents the progress of the sport’s youngest and brightest. Like Marty McFly visiting a Biff-ruled Hill Valley, Martin Odegaard has the benefit of a glimpse into his future. It’s up to him to make sure he avoids the pitfalls that have felled so many others before him. Such foresight should not hinder the Norwegian, but rather help guide him toward the career his talent promises. Of course, there are shimmering success stories to encourage Odegaard. Lionel Messi was once a wunderkind, scoring youth team goals with the ease of a young Cherno Samba, and he’s done quite well for himself. And Cristiano Ronaldo, who made a £12 million move to Manchester United from Sporting Lisbon as a scrawny 18-year-old, made the grade and then some. “There have been a few players described as ‘the new George Best’ over the years, but this is the first time it’s been a compliment to me,” Best would gush when the Portuguese was handed his iconic no. 7 jersey. Others sit awkwardly between what might have been and what actually became. As a teenager, Wayne Rooney was considered England’s finest-ever player in waiting, earning a £25.6 million move to Man U on the back of an astonishing Euro 2004 campaign, netting four goals in as many games. While Rooney could by no measure be regarded a failure – he will in almost all certainty become both England and Manchester United’s top scorer of all time – a twinge of regret shades his career to date. For all that he is, he could have been so much more. Soccer, like most sports, trades in hope. It entices fans into thinking the next game will be a classic, that this season will be legendary. It’s why Arsenal paid £16 million for the raw yet supremely talented 19-year-old Calum Chambers this summer, why Manchester United continue to persevere through the patchy form of Adnan Januzaj, and why transfer gossip is the sport’s tedious lifeblood. There’s always the prospect that one player, one signing could change everything. Right now, the hope that Odegaard will indeed become a bona fide star of the sport is setting his value — reported to be around €12 million, a price many European superclubs are undoubtedly willing to pay. For suitors of the next generation, potential trumps ability. Soccer is always searching for the next Pele, the next Maradona, the next Messi, the next big thing. Such tags are unfair, placing unrealistic expectations on players who are generally too young to handle it. It’s a burden that breaks more players than it makes. So if soccer’s latest wunderkind is looking for a name to grow into, sticking with “Martin Odegaard” will do just fine. Graham Ruthven (@grahamruthven) is a freelance soccer writer. You can read his work at the New York Times, The Guardian, and Vice, among other places. A lot of this is down to YouTube making amateur scouts out of all of us.